Leriba Hotel and Spa is a 4 and 5 Star [TGCSA] hotel nestled on 12 hectares of indigenous bush on the banks of the Hennops River in Centurion. The hotel is strategically located with only 35 minutes from JHB & OR Tambo, 10 minutes from Pretoria and walking distance from Centurion City. We offer complimentary shuttle service to and from the Centurion Gautrain Station. The hotel boasts: *73 luxury en suite rooms which includes 15 Five(5)Star Business Suites. 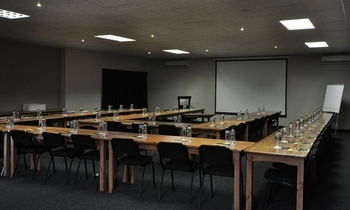 *20 fully equipped conference venues that can accommodate up to 1200 delegates per day. *Wide variety of teambuilding adventures. *2 full a la carte restaurants with walk in wine cellar. *Leriba Spa and Wellness Centre. *Swimming pools, pergola and private dining areas. Leriba Hotel Group offers a haven of natural elegance with luxury accommodation, prompt service and superior facilities.